Comic book fans are said to be furious after leaked footage from the forthcoming Batman vs Superman film shows the pair initially fighting each other until the fight is broken up by Bananaman, who demands that they both apologise to each other and learn to settle their disputes in a more gentlemanly manner. However, one graphic novelly type we spoke to told us that the inclusion of a banana eating crime fighting super being had ruined the entire film for him before he had even seen it. He would only be watching it out of curiosity, and of course to avoid the otherwise emptiness and desolation of his life that had been temporarily forgotten through the concept of a film with both Batman and Superman in it. “Bananaman has never been in any marvel comics. Superman comes from planet Krypton, Batman is a billionaire who knows kung fu. 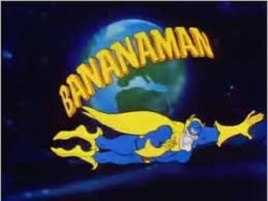 Bananaman is just ridiculous and his inclusion ruins what would otherwise be a very feasible story.” he explained. Samuel L Jackson who will be playing Hong Kong Phooey in the film has remained tight lipped about the plot. “I’m not telling you a motherfucking thing” he told us.